Three rocks emerge from the water, they are part of an extinct volcanic crater and, together with the submerged pinnacles, gives this dive the shape of an open semi-circle. In the middle of it, an imposing pinnacle (El Pinaculo) emerges from the 32 meters depth bottom and creates funky washing machines. In front of it, between two of the exposed rocks, other three aligned pinnacles are set as the gate: the entrance to the dive spot. 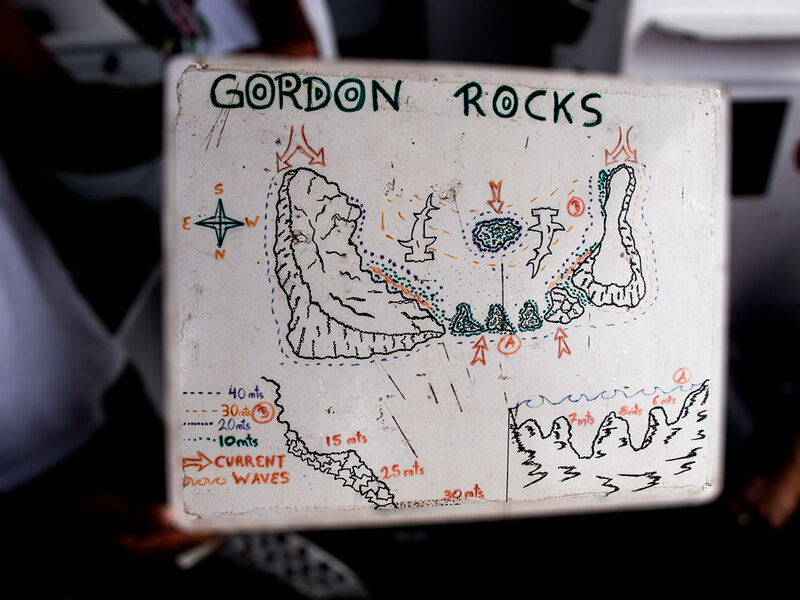 Gordon Rocks is probably the best diving site that you can reach from Santa Cruz, without the need of joining a liveaboard excursion. You can reach it within 45 minutes to 1 hour navigation from Puerto Ayora. La Lavadora (washing machine), the local name of this site, is considered one of the most challenging dives in Galapagos. When there is current, it totally deserves the recognition. Like most of other places around the world, it depends on the day, the hour, the moon and many other factors, so as you could dive Gordon without a breeze of current, most of the time you’ll have from moderate to intense current as well. This is why it is not recommended for beginner divers. Knowing ahead that the whole wall you can dive along is only 70 / 100 meters long – after which the blue welcomes you – is important how to plan the dive. Usually you start from outside of the three pinnacles, along the wall of the massive rocks emerging from the water, where there is not much current and is also protected from waves; the perfect entry point. You swim a bit along the wall in the blue till you reach the pinnacles and there you go, the real fun starts! Have you ever been on a rollercoaster? The feeling is just the same: you ride slowly up and then all of a sudden everything drops in front of you, including your inner self… and the ride begins! When you reach the pinnacles you’ll start feeling the current pushing you inside this old crater, the circle created by the rocks. Moving close to the wall, or behind the pinnacles, here you are mostly protected, and you can easily hold-on and have a broad look about. In the blue and around the pinnacles myriad of fish are dancing with rhythmical movement as if after a joyful Latin-American music, while this magical choreography is completed by the dark lavic stones, forming the pinnacle, and the deep blue of the water. 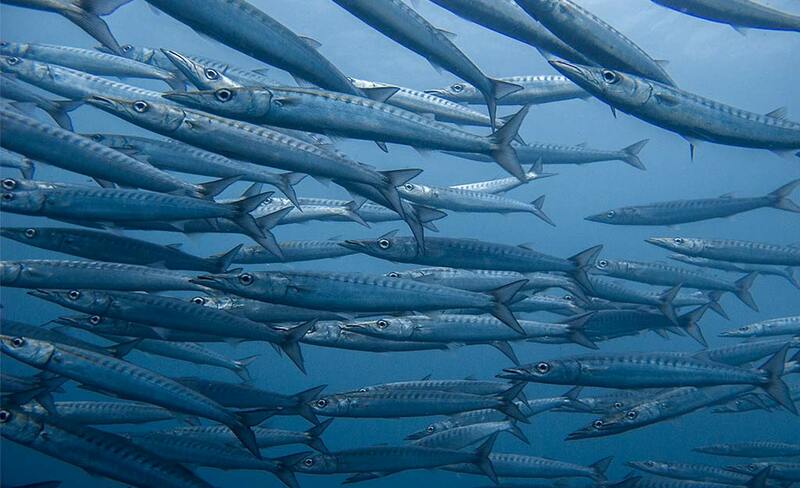 A turbine of curious barracudas appear from the blue and get closer and closer, one or two turtles swim around the pinnacles together with a few whitetip sharks. The white sandy bottom makes it easy to spot them, their unique shape make them unmistakable, yes… a wall of hammerheads are swimming just below you, you quickly exhale to descent at their depth and get nearer and nearer. At first the hammerheads swim away but then they come back and pass right in front of you, one or two get away from the group, they point straight at you and only when they’re one meter away they turn and re-join the group again. The hammerheads slowly disappear into the blue but a swarm of eagle rays appears from the other side, they pass right next to you and then are swallowed up as the sharks. You’re now in the middle of the crater, and the current is pushing you more and more, you make your way closer to the wall and slowly get off the bottom. 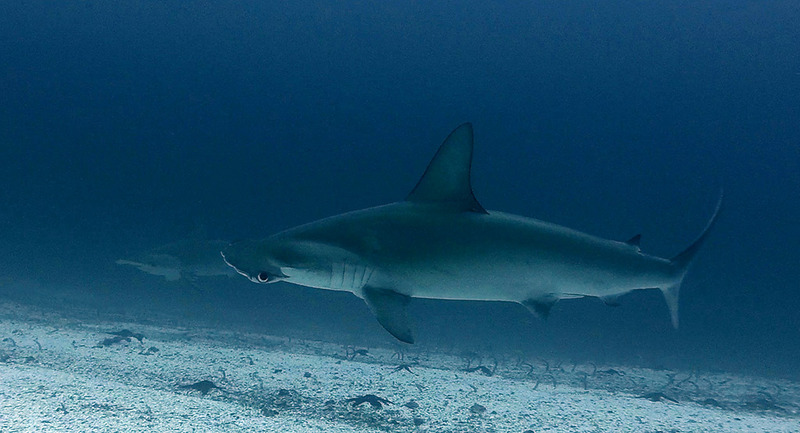 A few more whitetip sharks and a couple of galapagos sharks welcome you back. You let the current take you till the edge of the rocks and then swim outside of the crater, behind it, where the current is not pushing, a good location to make your safety stop, throw your smb and get to the surface. 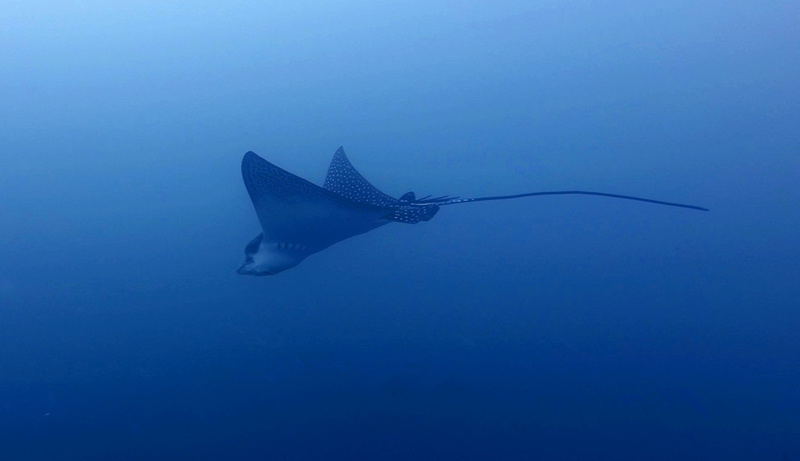 Yes… that’s a must dive in Galapagos, you can see even whale sharks and mola mola, sunfish, around here. That was my fabulous dive, and I hope you will enjoy it shortly too!